When I was a child I played Pac-Man… a lot. Pac-Man was all the rage back then. My father used to drive me down to the local video arcade after school and give me three quarters. They had a few other games, but I stood in line for Pac-Man. Even though I was only seven years old, I have to admit I became pretty good. The problem with playing a video game too much is that you start to dream that you’re in the game, especially if it involves some kind of maze or puzzle you have to solve. Anyone who has ever played Tetris before going to bed understands this experience, but it was a new concept back in 1982. After one especially long day of gobbling power pellets (I cashed-out my allowance for some extra quarters), I curled up into bed with my stuffed E.T. doll and drifted away. Moments later, I found myself running through a dark maze with colorful ghosts chasing me at top speed. Eventually, the ghosts caught up and had me cornered. Just as they were about to close in, I woke up screaming. My parents rushed to my room. They were relieved to hear it was only a nightmare, but I was still shaken. Mom scolded Dad for letting me play that game so much, but he insisted it was still better than watching TV all day. 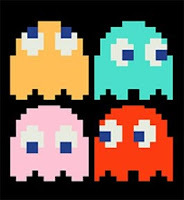 She told him that if he was going to keep letting me play Pac-Man then he needed to make sure I wasn’t afraid of ghosts. She said it was his responsibility that I grew up as a normal, healthy boy without any ridiculous childhood trauma. The next day, Dad picked me up from school and told me he had a special surprise for me. He said that we were going straight home instead of stopping by the arcade, and that we were going to take care of my ghost problem once and for all. When we arrived at the house, he pulled a large cardboard box out of the trunk. I asked him what it was and he said it was called a VCR. It took Dad a long time to hook the machine it up to the TV, but he figured it out. He said it would be like having our own movie theater, and the first movie we were going to watch was going to show me how fun ghosts can be. Unfortunately, my father had never before seen The Exorcist and didn’t realize it wasn’t a comedy. I still can’t play Pac-Man without having a panic attack.